MotionSense Touchless Kitchen Faucets. Inspired by movement. Innovated by Moen. Le système Reflex® de Moen est conçu pour offrir un champ de mobilité exceptionnel combine à une excellente function auto-retractable. 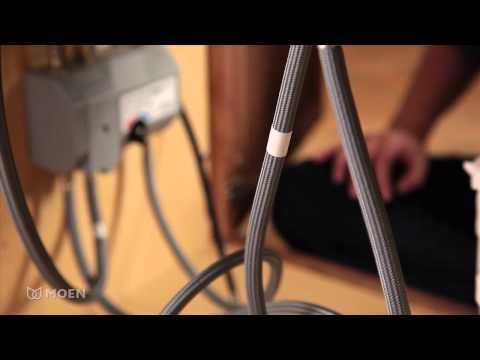 Moen made every effort to ensure MotionSense is quick and straightforward to install. All connections are clearly labeled. No complicated subassembly is required, no electrician is needed. MotionSense is powered by a battery back, but offers the option of an AC adapter. Under-cabinet controls allow you to easily adjust the desired preset water temperature of the hands-free mode. Why touch your kitchen faucet when you don’t have to? Thoughtfully designed with the user in mind, Moen’s MotionSense™ hands-free technology makes completing kitchen tasks easier, detecting your movements and setting water flow in motion with just the wave of a hand.